Amaravati and the Korkus in Maharashtra came into the world's media spotlight in 1992. BBC came into the interior villages, reporting on children belonging to Korku tribe starving as the outside world looked on in amazement. Help came in the form of food packets and medicines through World Health Organisation. Besides, many voluntary organizations too stepped in to the field with similar measures. Today these incidents have long been forgotten. The cause on the one hand are lack of education and ill-health, on the other hand is irresponsibility and cycle of exploitation. In many villages, 'fence eats up the crops'. Awagad, is one such village that depicts the classic tale of exploitation. Many have not tread into that village, where one can hear stories which are hitherto unheard. Travelling from Nagpur for 7 hours one can reach Chikaldara hills. Melghat Tiger Reserve and Project Tiger, are some of the bill boards that welcome the ones who reach there. Sources close to these resorts say, there are 88 tigers (1992 source) in this tiger reserve. Given the importance to tigers, one will get a feel whether tigers are more pampered than human beings. Awagad is one of the Korku villages situated in the vicinity of Chikaldara, 33km from Semoda which is in Dharni - Paratwada road. To 'serve' the people here, forest, education and health departments compete among themselves. To Korkus who is also known as Vanavasi (forest dweller) work in forest department. Whenever they are in occupation, they ought to fetch a bunch of firewood. This will found its place in the hearth of forest officials. If the coolies work for two days they fetch Rs. 14 per day, provided they must thump sign a voucher stating three days wages given to them. Once the officer left, one day's wage should be returned to the forest guard. In that, cost of the revenue stamp Re.1 will be deducted! If the same Korku happens to chop a bamboo for building his hut, he will be fined Rs. 20/- by the aforesaid forest official. If the Korku manages to offer a chicken or a bottle of country liquor, he may be exempted from fine. Every year during the harvest, each Korku family has to supply 5 kilos of Jawari (grains in this region) to the forest guards - another example of exploitation. Korku in Awagad live in literal darkness, in the absence of electric supply. Many years before electric supply had been extended to the village. In 5 houses, electric wiring were finished. But due to the objection of the forest department, the lines were never electrified, saying that the line would touch a tree. In Makla village, situated 11 km away from Semoda, condition was even worse. Electricity had not reached there. The ill-fated villagers have to go to Churnia, another hill town, trekking many miles to procure kerosene, that too at a double price. Korkus found it easier to keep wood burning all night to keep the village lit. In summer, people of Awagad feel acute shortage of water. Two wells dug by government was dried up then. Tube well, which was dug a year back was not functioning. Once in a while a wobbling truck loaded with water reaches there. Since the plastic tank setup for emptying the trucks, was flown away, the remaining water had to be released to one of the dried well. A school was there with two class rooms. Pupils up to fourth standard are supposed to be taught there. One of the teachers seldom comes there commuting from neighboring Churnia. After receiving the appointment order and working for two months, the teacher went home and never to be returned. In Awagad there were neither ration depots (fair price shops for the poor) nor public health centers. Some doctors frequent there seeking patients selling medicines and treat all sicknesses. If an expense towards transport is given they come on motor cycles for emergencies. If some quarters accuse development is standstill there, government side was unwilling to accept. According to government records, many roads, bridges and buildings were constructed. But all these were alleged to be swept away in the rains. 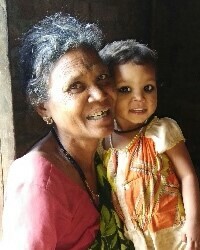 Korkus are Adivasis (tribal/ natives) who never complain. Otherwise who is interested to listen to their grievances? They somehow manage to make both ends meet. Paddy received from cultivation, vegetables, firewood gathered from forests, and other commodities are sold in the nearby weekly village markets. Wooden pillars erected from the floor are the main base of the house they make. The roof is thatched with bamboo frames and hand made tiles. Bamboo mats form the skeleton of the walls which is smeared with mud. There they lay their heads dreaming about a better tomorrow. Korku Village Mission had been in existence 100 years ago in Chikaldara focusing on Korku tribes. Many tombs could be seen in the bushy cemetery where most of the marble slabs were taken and the total number is not known. Eleven tombs with inscriptions could be seen there. Korku Baptist Mission, founded by Americans with their mission compound and activities were withdrawn in late 40s handing over the responsibility to the Baptist Church Association located at the district head quarters. In 1981, Indian Evangelical Mission (IEM) took over this field and began an outreach training institute in Chikaldara. The missionaries who were trained there worked among many tribes and communities in general and Korkus in particular. After the last 14 years the condition of the Korkus certainly must have changed - better or worse. But the struggle of malnutrition, frequently plague these hills. In 1992 about a thousand children were died of malnutrition. 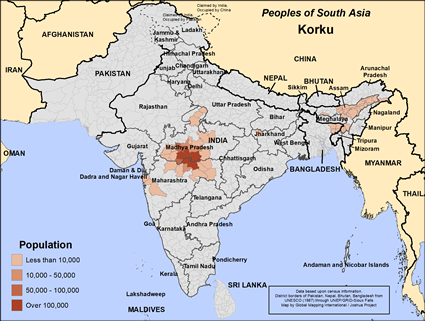 In the year 2001, Outlook Magazine reported 1,400 deaths in the region. View Korku in all countries.